Bravo.. well said. Thank you for this share. I have shopped in some of the most high-end stores in Canada, Holt Renfrew, Ports, Frieda’s (they dress Tracy Moore) and to be honest your store does not come close, and guess what I even a a few pieces from Joe Fresh, which u seem to feel the need to deride. When you start carrying real cashmere from Scotland and not crap from China then maybe u could consider yourself a little higher on the scale. Your store is far to crowded, even at Fashion Frenzie, I do not have to comb thru clothes all jammed together. Your whole attitude seems very snotty and even small town folk don’t like that, I will be surprised if you are still open in 2015, but good luck trying. I appreciate your comments and I recall your quest for cashmere from Scotland. I was there in 2010 and indeed most of their fine woolens are now manufactured in China as well. The sad truth is the closure of so many manufacturing facilities in North America and Europe because of the transition to cheap labour in Asia. That’s true of all kinds of manufacturing including auto parts etc. The good news is that labour standards in China have risen considerably and some of the finest quality manufacturing comes from there. New technologies and advanced skills have led to that and China now reports the top wages among garment manufacturing countries. That’s not to say more improvements aren’t needed in some places but progress is always slower than we would like. Now garment manufacturers are flocking to countries like Bangladesh where workers are paid the lowest scale in the world – about $14.00 a month and often work in terrible conditions. Speed and efficiency keep prices low which is why you won’t find a lot of quality, Hopefully with world attention, after the big fire in April, conditions will improve there as well. Your second comment about the store being overcrowded is well taken. We are working to improve that. In the early years of business it’s always a struggle to find the right balance as we get to understand our clients, sizes, etc. As for the rest of your comments – many people are so happy to have a store like ours on your Main Street and thankfully they wish us well. This was an argument about quality and artistic merit. The stores you mentioned are definitely great stores but there is something to be said about the ability to find a piece of clothing that is unique that can not be found in other places, especially in Nova Scotia. Other high end stores are like one another in many ways in that they carry similar products amongst each other. A Holt Renfrew in Calgary would probably not be all that different from a Holt Renfrew in Toronto nor would they be all that different from other high end stores found in other places in Canada and abroad. There is only one Aphrodite and the range of products they carry are exceptionally diverse and reflective of an artful approach towards fashion. This is something that you just don’t find anywhere in Nova Scotia, especially in small towns. In communities like Antigonish, people will always talk and Aphrodite already has a reputation of being expensive among the locals. Luckily the store also has a reputation around the rest of the province as something special and worth seeing. Having the store on Main Street makes Antigonish a new shopping destination for folks from around the province. Wal-Mart can’t draw people in from Halifax to Antigonish but Aphrodite can. Not everyone can walk in there and buy their yearly wardrobe as it is not the place for most people to buy their everyday clothes. However, if you want to wear something special, beautiful and unique that can be worn forever and ever, there are few places of compare in northern Nova Scotia (or even province wide). Joe Fresh is fine and dandy, and Fashion Frenzies is too, but you would never buy something from them to wear to a wedding, prom, or other special time in your life. At Aphrodite you could. Price is not always the main concern when customers are presented a superior product. There is specific target market for Aphrodite where high quality, artistic merit, beauty and uniqueness is critical. The care and thought that goes into providing the clothing that meets these criteria will ensure that the selection will remain unrivaled in Nova Scotia. This will continue to attract customers helping Aphrodite thrive well into the future. That was an amazing response! Thanks! Thanks for your lovely message. We’re so grateful for customers like you. This is a perfectly worded message – right on target. slow fashion rules!!!!! thank you Tiu for bringing it to Nova Scotia! Good take on the subject. Nothing good ever comes fast. Thanks! What a wonderfully written piece! It is so true what you say about sustaining the fashion industry in a responsible way. There are so many big names out there, who simply treat you as a sale on the rack rather than a real customer who walks through the door. Beyond that, you are right about being more contentious about the purchases we make, and how they affect the rest of the world. The classic line of buy it nice or buy it twice comes to mind; it speaks volumes when measuring quality, ethical shopping and even goes as far as to consider the impact crappy clothes have on the environment. Bravo! Well said! Thanks Mama! Commoditization is cheaper than creativity – which is why everything is starting to look the same. Bravo to all the independent retailers who have the courage to do their own thing! For sure it’s not easy but thankfully there are enough people who get it who will help sustain us.Thanks for your comment! I am so grateful to have such a beautiful,artful(art-filled!) 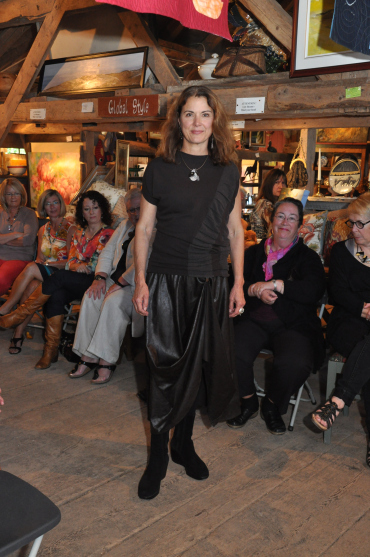 store as Aphrodite in Antigonish. Another gem on Main Street! Thank you for your excellent essay,Tilu. My frugal Mom,on a modest teacher’s salary,always looked fabulous,even at 91! She taught my sisters and me,when shopping for clothes, to plan carefully,buy quality,accessorize the outfit before leaving the store,and then resist buying bits and pieces on the sale racks. Wise advise from a generous lady who always lived within her means. She would have shopped at Aphrodite! That is wise advice. Thanks so much for your comments. Thank you, thank you, thank you! I admire your bravery to write an article like this one! It’s such a touchy subject also for us artists that are also competing with the big box stores. The refreshing part about working with you is that you that seek out designers that are taking a risk with what they are creating and you believe in us!!!! Thanks for making glamjulz shine at Aprhodite. You are far from a snob. You are a person that cares whole heartedly for her customers and also for her suppliers. We’re all in this together – creative minds trying to take their place in this commoditized world where only profit prevails. Thanks for your comments – you are so much more than a supplier.